Less is more! That principle is true for makeup too. The soft gorgeous natural look never goes out of style. It let your true beauty shine through, and is great for work, school, and many other everyday occasions. These natural makeup tutorials will help you master that look. I love makeup and guess you love it too. But we can safely agree that wearing a full face of makeup everyday is not a good idea. I only do that for big events. To look pretty in a daily basis, I only do light natural makeup look. I look polished, pretty, but still totally me. My natural looks are very easy to do. The only take a tiny bit of work. And they almost look like I have no makeup at all. But I don’t look too pale or too bare-faced. Often many men thought I have no makeup. But they do agree that I look more beautiful and thought I have natural glowing skin, beautiful eyelids, and gorgeous lips. Natural makeup sounds very easy, but it is quite challenging for beginners. Because, it is hard to pick the exact right colors that work for your skin tone and blend them invisibly. You need to learn and practice to become good. Today, I have rounded up the best natural makeup tutorials and passed along to you. They are great to help you get the perfect appearance. Hopefully, you can master a natural makeup tutorial or two, and can rely on them for your attractive looks! Check back occasionally to find more natural makeup ideas as we add more from time to time. 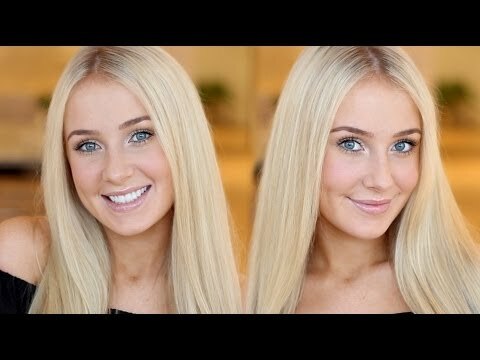 # 1 NO MAKEUP' Makeup Tutorial! I love this look because it\'s light enough to let the natural you shine through but it\'s still just enough makeup to keep you feeling your best! Report for NO MAKEUP' Makeup Tutorial! Submission Name NO MAKEUP' Makeup Tutorial! Finding the right makeup to wear when you’re going for a natural look can be more complex than you think. You don’t want anything too cakey, too bright, or too dark. And we all know, that looking natural does indeed require SOME makeup application – and some skill, too. The best tip that we have for you is to wear colors close to your natural skin tone, and ones that just enhance and perfect your skin.